The police here today apprehended four members of a gang which had looted goods worth Rs 1.50 crore from an NRI on October 7.A diamond-studded gold watch worth Rs 30 lakh, a gold pen worth Rs 2 lakh and sunglasses worth Rs 15,000 were recovered from the accused. It’s a classic case of law-makers turning violators. 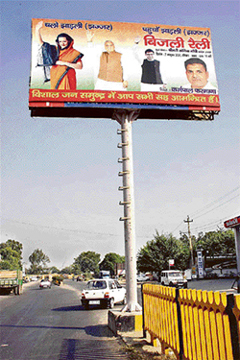 Numerous publicity boards and hoardings, many of these publicising rallies and other political programmes of the ruling Congress, dot the National Highway No. 10 passing through the town in total violation of rules and specific directions of the apex court and high court. World Bank has decided to send a multi-sectoral team to Haryana for providing assistance in various projects. The state has submitted proposals for funding projects worth Rs 12,648 crore for major infrastructural development of highways, water supply and sanitation and power in the state. Former minister Hari Singh Saini was seriously injured in a road accident here this morning. His car driver Ram Niwas died on the spot while two others accompanying Saini were injured in the accident. Offers of help have started pouring in for AIDS victim Mohan and his hapless father Nand Kishore ever since The Tribune highlighted the plight of the patient. The victim was admitted to the local general hospital, but was soon discharged by the hospital authorities after they came to know about his HIV positive status. The Haryana government will increase the number of seats in all polytechnics and ITIs in the state to give more opportunities to students and fulfil the growing demands of the new industries coming up in the state. Labour and technical education minister, Haryana, A.C. Chaudhary disclosed this today on his first visit to Gurgaon. In a major breakthrough, the police today recovered BSNL’s ground cable worth Rs 12 lakh, which was stolen from the middle of the city on September 6. The police also arrested one more accused, a member of an inter-state gang, involved in the case. Six persons had already been arrested in the case. Four persons died when the auto-rickshaw they were traveling in was hit by a truck on the National Highway 8, near Sidhrawali village, near Manesar, last night. Police sources said three members of a family of Kharkhari village, who were returning home after visiting a patient in the Raman Munjal hospital in Manesar, died in the accident. The Sonepat police today arrested a reporter of a Hindi daily from Kharkhoda town of Sonepat for allegedly filing a ‘fabricated’ news story that caused communal tension in the area. Haryana Governor A.R. Kidwai and Chief Minister Bhupinder Singh Hooda have congratulated the people of Haryana on the auspicious occasion of Id-ul-Fitr. The police here today apprehended four members of a gang which had looted goods worth Rs 1.50 crore from an NRI on October 7. A diamond-studded gold watch worth Rs 30 lakh, a gold pen worth Rs 2 lakh and sunglasses worth Rs 15,000 were recovered from the accused. Two persons had been caught on the same day the crime was committed. Deepak Mehta, a USA-based NRI and originally belonging to Ambala, called up his close friend Karan Datta and informed him that he was going to visit his home town and requested Karan to pick him up from Delhi. Datta called up his friends Karan Nijhawan, Subhash, Ripul, Amandeep and Saleel and hatched a plan to rob Deepak. Datta went to pick Deepak from Delhi in the latter’s Ford Endeavour SUV. While coming back from there, they stopped at Karnal Haveli. There Datta gave duplicate keys of the vehicle to the other accused who fled with the vehicle. They later abandoned it after pocketing the valuables lying inside. Datta came under suspicion when experts from Ford pointed out that an Endeavour cannot be opened without any other key but its own. They also added that as there was no forced entry into this particular vehicle and it was most likely that it was opened with its own key. Under sustained interrogation, Datta spilled the beans and disclosed his role in the whole episode and named the other accused. He was promptly arrested along with Karan Nijhawan. All six accused have been released on bail. Some of these hoardings even cover the official signposts displaying traffic directions, making the matter even more serious and worthy of intervention of the authorities concerned. For instance, an official signpost situated near the Delhi bypass chowk in the town has been completely covered by hoardings of the ruling party announcing the time and venue of the “bijli rally” at Jharli village in Jhajjar district. (see photo). Though the rally is over, the hoardings are still there. The inconvenience and confusion caused to the thousands of travellers due to lack of directions is apparently of little significance. Interestingly, the signpost is right in front of the office of the Inspector-General of Police of the Rohtak range. However, for obvious reasons, senior police, administrative and municipal officials prefer to look the other way when they pass the signpost. The Supreme Court as well as the Punjab and Haryana High Court have issued specific directions against putting up such hoardings and other publicity material facing the roads as these divert the attention of drivers and may cause accidents. Nonetheless, gross violation of the courts’ directions and rules continues with impunity. As the publicity material is of the ruling party, the law-enforcement agencies remain mute spectators to such violations. World Bank has decided to send a multi-sectoral team to Haryana for providing assistance in various projects. The state has submitted proposals for funding projects worth Rs 12,648 crore for major infrastructural development of highways, water supply and sanitation and power in the state. According to an official statement, the decision was taken at a meeting held in Washington between the Haryana delegation led by Chief Minister Bhupinder Singh Hooda and World Bank officials for reviewing the project proposals. The World Bank officials said the bank was preparing a business plan for Haryana. A team from World Bank would visit Haryana during the end of October to study the project for the improvement of state highways and creating high-speed corridors, which is in the advance stage of approval. The project of Rs 5,888 crore ($ 1177.60 million) which aimed at the improvement of the state highways and creating high-speed corridors included up-gradation of 494 km of state highways to four lanes, widening of 1,033 km of state highways and widening of major district roads to 10 meters width. management with a project outlay of Rs 2,957 crore ($ 643 million) was discussed in the meeting. The state government has already submitted this project to the planning commission for approval. The bank assured that this project would be taken up on priority basis. The third proposal for the renovation, modernisation and upgrading of power generation and strengthening of transmission and distribution system with an outlay of Rs 3,803.37 crore was also discussed. Former minister Hari Singh Saini was seriously injured in a road accident here this morning. His car driver Ram Niwas died on the spot while two others accompanying Saini were injured in the accident. Saini was on his way to Hansi when his car collided head-on with another car coming from the opposite direction on the Hisar bypass on the National Highway-10. He was rushed to a private hospital here for treatment where his condition was stated to be serious. Saini was a minister in the Devi Lal cabinet from 1987 onwards. Hundreds of his supporters gathered outside the hospital on receipt of the news of the accident. Saini is now backing suspended Congress MP Kuldeep Bishnoi’s political campaign. Offers of help have started pouring in for AIDS victim Mohan and his hapless father Nand Kishore ever since The Tribune highlighted the plight of the patient. The victim was admitted to the local general hospital, but was soon discharged by the hospital authorities after they came to know about his HIV positive status. As the victim had no one to attend to and his father had already sold his parental house to meet the former’s medical expenditure, the victim had been lying in the open crying for “mercy death” to get relieved of the pains and suffering. When Navdeep Rai, a person of Indian origin living in Dubai, read this story, he was deeply moved by the travails of victim Mohan and his father. He offered to send some money, which would be sufficient to meet the expenses of father-son duo's food and medicines, to the victim every month throughout the rest of Mohan’s life. Navdeep said he too shared The Tribune’s concern on the need for better understanding and reaching out to people. He said the story on Mohan and his father was truly moving. “I hope that my little contribution eases some of his worries,” Navdeep said. Earlier, C.P. Batra, a local progressive farmer and a philanthropist, had offered financial help to the victim. Meanwhile, Divya Mithel, a Maharashtra-based doctor working for the welfare of AIDS patients, has offered that if anyone could arrange to get Mohan to her Jyotis Care Centre at Raigad in Maharashtra, which she admitted might be difficult, she would try to reduce victim’s pain in the last few days of his life. Mohan, meanwhile, is undergoing treatment at PGI, Rohtak, after the local health authorities shifted him to Rohtak after The Tribune highlighted the issue. The Haryana government will increase the number of seats in all polytechnics and ITIs in the state to give more opportunities to students and fulfil the growing demands of the new industries coming up in the state. Labour and technical education minister, Haryana, A.C. Chaudhary disclosed this today on his first visit to Gurgaon. He revealed that there were 2,800 seats in all polytechnic and ITIs in the state and over 21,000 applications were received last year. Keeping in view the interests of students in vocational courses, the government has decided to increase the number of seats and also introduce about 60 new vocational courses from the next session. In a major breakthrough, the police today recovered BSNL’s ground cable worth Rs 12 lakh, which was stolen from the middle of the city on September 6. The police also arrested one more accused, a member of an inter-state gang, involved in the case. Six persons had already been arrested in the case. Police sources said the six accused during the interrogation had provided vital clues and thereafter BSNL’s ground cable was recovered from Badali village near New Delhi. Four persons died when the auto-rickshaw they were traveling in was hit by a truck on the National Highway 8, near Sidhrawali village, near Manesar, last night. Police sources said three members of a family of Kharkhari village, who were returning home after visiting a patient in the Raman Munjal hospital in Manesar, died in the accident. The driver of the auto-rickshaw also died. The accident was so severe that the auto-rickshaw and the truck turned turtle. The driver of the truck fled the spot. The deceased have been identified as Sanjay, Dharmender, Dharamveer and Surjeet. 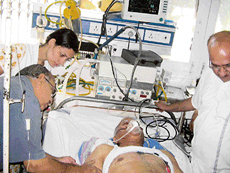 The first three died on the spot, while Surjeet was rushed to a hospital, where he succumbed to his injuries. All deceased are in the age group of 22-30 years. The reporter, Ajit Ram Bansal, is also charged with misrepresenting the facts in coverage of a crime incident. He was arrested from his office and later produced in a local court, which sent him to a 14-day judicial custody. Police sources said the reporter had filed a story about kidnapping of a Dalit woman.